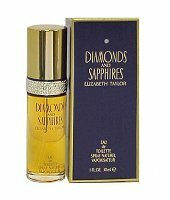 Elizabeth Taylor introduced Diamonds & Sapphires in 1993. This feminine scent possesses a blend of fresh cut floral bouquet of lily of the valley, rose, ylang ylang, jasmine and spice. Diamonds & Sapphires is recommended for office use.